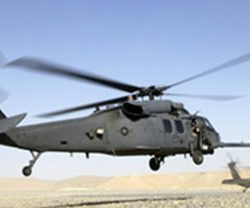 The helicopter used by the Air Force for combat search and rescue crashed in western Iraq. An HH-60 Pave Hawk helicopter, the type of helicopter that crashed in western Iraq on Thursday. BAGHDAD — The Pentagon says all seven service members aboard a U.S. helicopter that crashed in Iraq were killed. The Pentagon said an accompanying U.S. helicopter immediately reported the crash and a quick-reaction force comprising Iraqi security forces and Coalition members secured the scene.